On (special) relativity: what’s relative? As you can see, under a Lorentz transformation, the new ‘primed’ space and time coordinates are a mixture of the ‘unprimed’ ones. Indeed, the new x’ is a mixture of x and t, and the new t’ is a mixture as well. You don’t have that under a Galilean transformation: in the Newtonian world, space and time are neatly separated, and time is absolute, i.e. it is the same regardless of the reference frame. In Einstein’s world – our world – that’s not the case: time is relative, or local as Hendrik Lorentz termed it, and so it’s space-time – i.e. ‘some kind of union of space and time’ as Minkowski termed it – that transforms. In practice, physicists will use so-called four-vectors, i.e. vectors with four coordinates, to keep track of things. These four-vectors incorporate both the three-dimensional space vector as well as the time dimension. However, we won’t go into the mathematical details of that here. What else is relative? Everything, except the speed of light. Of course, velocity is relative, just like in the Newtonian world, but the equation to go from a velocity as measured in one reference frame to a velocity as measured in the other, is different: it’s not a matter of just adding or subtracting speeds. In addition, besides time, mass becomes a relative concept as well in Einstein’s world, and that was definitely not the case in the Newtonian world. What about energy? Well… We mentioned that velocities are relative in the Newtonian world as well, so momentum and kinetic energy were relative in that world as well: what you would measure for those two quantities would depend on your reference frame as well. However, here also, we get a different formula now. In addition, we have this weird equivalence between mass and energy in Einstein’s world, about which I should also say something more. But let’s tackle these topics one by one. We’ll start with velocities. So, in the Newtonian world, it’s just a matter of adding/subtracting speeds indeed: if my car goes 100 km/h (v), and yours goes 120 km/h, then you will see my car falling behind at a speed of (minus) 20 km/h. That’s it. In Einstein’s world, it is not so simply. Let’s take the spaceship example once again. So we have a man on the ground (the inertial or ‘unprimed’ reference frame) and a man in the spaceship (the primed reference frame), which is moving away from us with velocity u. Suppose the object is moving at half the speed of light, so 0.5c, and that the spaceship is moving itself also at 0.5c, then we get the rather remarkable result that, from the point of view of the observer on the ground, that object is not going as fast as light, but only at vx = (0.5c + 0.5c)/(1 + 0.5·0.5) = 0.8c. It’s interesting to note that, even if u has no y– or z-component, velocity in the y direction will be affected too. Indeed, if an object is moving upward in the spaceship, then the distance of travel of that object to the man on the ground will appear to be larger. See the triangle below: if that object travels a distance Δs’ = Δy’ = Δy = v’Δt’ with respect to the man in the spaceship, then it will have traveled a distance Δs = vΔt to the man on the ground, and that distance is longer. 1/γ is the reciprocal of the Lorentz factor, and I’ll leave it to you to work out a few numeric examples. When you do that, you’ll find the rather remarkable result that vy is actually less than vy’. 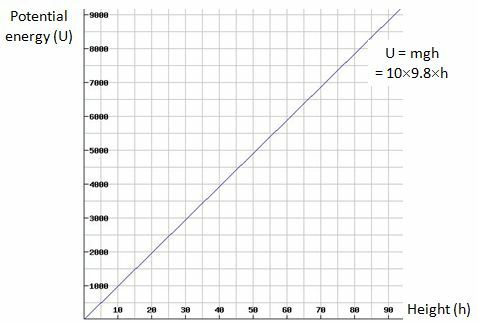 For example, for u = 0.6c, 1/γ will be equal to 0.8, so vy will be 20% less than vy’. How is that possible? The vertical distance is what it is (Δy’ = Δy), and that distance is not affected by the ‘length contraction’ effect (y’ = y). So how can the vertical velocity be smaller? The answer is easy to state, but not so easy to understand: it’s the time dilation effect: time in the spaceship goes slower. Hence, the object will cover the same vertical distance indeed – for both observers – but, from the point of view of the observer on the ground, the object will apparently need more time to cover that distance than the time measured by the man in the spaceship: Δt > Δt’. Hence, the logical conclusion is that the vertical velocity of that object will appear to be less to the observer on the ground. How much less? The time dilation factor is the Lorentz factor. Hence, Δt = γΔt’. Now, if u = 0.6c, then γ will be equal to 1.25 and Δt = 1.25Δt’. Hence, if that object would need, say, one second to cover that vertical distance, then, from the point of view of the observer on the ground, it would need 1.25 seconds to cover the same distance. Hence, its speed as observed from the ground is indeed only 1/(5/4) = 4/5 = 0.8 of its speed as observed by the man in the spaceship. Is that hard to understand? Maybe. You have to think through it. One common mistake is that people think that length contraction and/or time dilation are, somehow, related to the fact that we are looking at things from a distance and that light needs time to reach us. Indeed, on the Web, you can find complicated calculations using the angle of view and/or the line of sight (and tons of trigonometric formulas) as, for example, shown in the drawing below. These have nothing to do with relativity theory and you’ll never get the Lorentz transformation out of them. They are plain nonsense: they are rooted in an inability of these youthful authors to go beyond Galilean relativity. Length contraction and/or time dilation are not some kind of visual trick or illusion. If you want to see how one can derive the Lorentz factor geometrically, you should look for a good description of the Michelson-Morley experiment in a good physics handbook such as, yes :-), Feynman’s Lectures. So, I repeat: illustrations that try to explain length contraction and time dilation in terms of line of sight and/or angle of view are useless and will not help you to understand relativity. On the contrary, they will only confuse you. I will let you think through this and move on to the next topic. As evidenced from the formula above, the momentum formula is a relativistic formula as well, as it’s dependent on the Lorentz factor too. So where do I want to go from here? Well… In this section (relativistic mass and momentum), I just want to show that Einstein’s mass formula is not some separate law or postulate: it just comes with the Lorentz transformation equations (and the above-mentioned consequences in terms of measuring horizontal and vertical velocities). Indeed, Einstein’s relativistic mass formula can be derived from the momentum conservation principle, which is one of the ‘physical laws’ that Einstein refers to. Look at the elastic collision between two billiard balls below. These balls are equal – same mass and same speed from the point of view of an inertial observer – but not identical: one is red and one is blue. 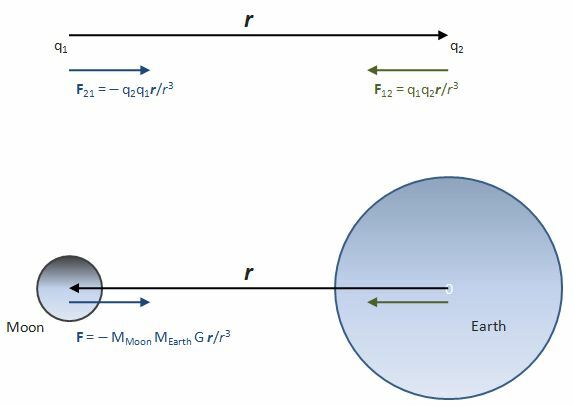 The two diagrams show the collision from two different points of view: left, we have the inertial reference frame, and, right, we have a reference frame that is moving with a velocity equal to the horizontal component of the velocity of the blue ball. 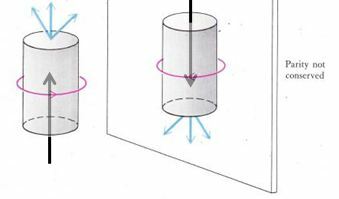 The total momentum of such elastic collision before and after the collision must be the same. Because the two balls have equal mass (in the inertial reference frame at least), the collision will be perfectly symmetrical. Indeed, we may just turn the diagram ‘upside down’ and change the colors of the balls, as we do below, and the values w, u and v (as well as the angle α) are the same. As mentioned above, the velocity of the blue and red ball and, hence, their momentum, will depend on the frame of reference. In the diagram on the left, we’re moving with a velocity equal to the horizontal component of the velocity of the blue ball and, therefore, in this particular frame of reference, the velocity (and the momentum) of the blue ball consists of a vertical component only, which we refer to as w.
From this point of view (i.e. the reference frame moving with, the velocity (and, hence, the momentum) of the red ball will have both a horizontal as well as a vertical component. If we denote the horizontal component by u, then it’s easy to show that the vertical velocity of the red ball must be equal to sin(α)v. Now, because u = cos(α)v, this vertical component will be equal to tan(α)u. But so what is tan(α)u? Now, you’ll say, that is quite evident: tan(α)u must be equal to w, right? Huh? Yes. Just think about it: tan(α)u = (1/γ)w. But then… How can momentum be conserved if these speeds are not the same? Isn’t the momentum conservation principle supposed to conserve both horizontal as well as vertical momentum? It is, and momentum is being conserved. Why? Because of the relativistic mass factor. What does this mean? It means that mass of the red ball in the diagram on the left is larger than the mass of the blue ball. So here we have actually derived Einstein’s relativistic mass formula from the momentum conservation principle ! Hmm… You’ll probably find all of this quite fishy. I’d suggest you just think about it. What I presented above, is actually Feynman’s presentation of the subject, but with a bit more verbosity. Let’s move on to the final. Now, what does this equivalence actually mean? Is mass energy? Can we equate them really? The short answer to that is: yes. Indeed, in one of my older posts (Loose Ends), I explained that protons and neutrons are made of quarks and, hence, that quarks are the actual matter particles, not protons and neutrons. 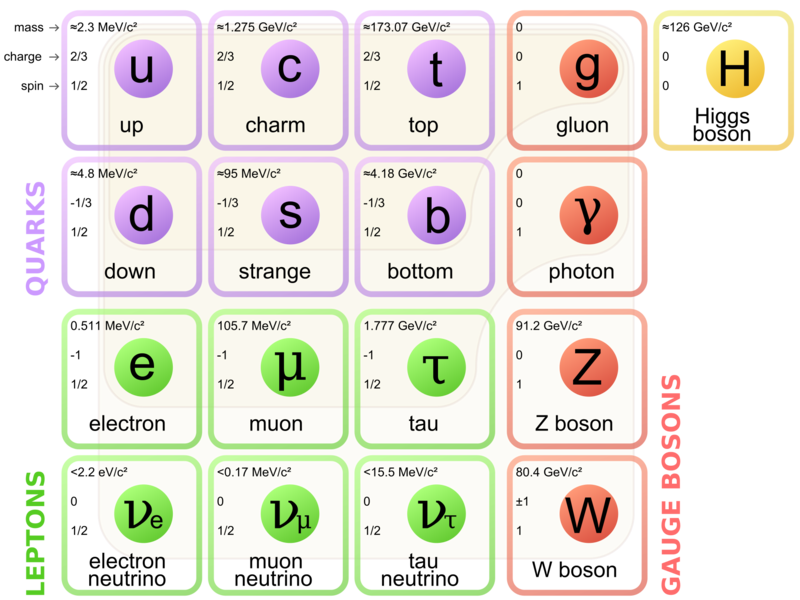 However, the mass of a proton – which consists of two up quarks and one down quark – is 938 MeV/c2 (don’t worry about the units I am using here: because protons are so tiny, we don’t measure their mass in grams), but the mass figure you get when you add the rest mass of two u‘s and one d, is 9.6 MeV/c2 only: about one percent of 938 ! So where’s the difference? The difference is the equivalent mass (or inertia) of the binding energy between the quarks. Indeed, the so-called ‘mass’ that gets converted into energy when a nuclear bomb explodes is not the mass of quarks. Quarks survive: nuclear power is binding energy between quarks that gets converted into heat and radiation and kinetic energy and whatever else a nuclear explosion unleashes. So that says it all, I guess, and, hence, that concludes my little ‘series’ on (special) relativity. I hope you enjoyed it. If none of what I wrote could convey the general idea, then I hope the above quote will. 🙂 Apart from that, I should also note that physicists will prefer to re-write the Lorentz transformation equations by measuring time and distance in so-called equivalent units: velocities will be expressed not in km/h but as a ratio of c and, hence, c = 1 (a pure number) and so u will also be a pure number between 0 and 1. That can be done by expressing distance in light-seconds ( a light-second is the distance traveled by light in one second or, alternatively, by expressing time in ‘meter’. Both are equivalent but, in most textbooks, it will be time that will be measured in the ‘new’ units. So how do we express time in meter? They are easy to remember in this form (cf. the symmetry between x – ut and t – ux) and, if needed, we can always convert back to the old units to recover the original formulas. I personally think there is no better way to illustrate how space and time are ‘mere shadows’ of the same thing indeed: if we express both time and space in the same dimension (meter), we can see how, as result of that, velocity becomes a dimensionless number between zero and one and, more importantly, how the equations for x’ and t’ then mirror each other nicely. I am not sure what ‘kind of union’ between space and time Minkowski had in mind, but this must come pretty close, no? We’ve been juggling with a lot of advanced concepts in the previous post. Perhaps it’s time I write something that my kids can understand too. One of the things I struggled with when re-learning elementary physics is the concept of energy. What is energy really? I always felt my high school teachers did a poor job in trying to explain it. So let me try to do a better job here. A high-school level course usually introduces the topic using the gravitational force, i.e. Newton’s Third Law: F = GmM/r2. This law states that the force of attraction is proportional to the product of the masses m and M, and inversely proportional to the square of the distance r between those two masses. The factor of proportionality is equal to G, i.e. the so-called universal gravitational constant, aka the ‘big G’ (G ≈ 6.674×10-11 N(m/kg)2), as opposed to the ‘little g’, which is the gravity of Earth (g ≈ 9.80665 m/s2). As far as I am concerned, it is at this point where my high-school teacher failed. Indeed, he would just go on and simplify Newton’s Third Law by writing F = mg, noting that g = GM/r2 and that, for all practical purposes, this g factor is constant, because we are talking small distances as compared to the radius of the Earth. Hence, we should just remember that the gravitational force is proportional to the mass only, and that one kilogram amounts to a weight of about 10 newton (9.80665 kg·m/s2 (N) to be precise). That simplification would then be followed by another simplification: if we are lifting an object with mass m, we are doing work against the gravitational force. How much work? Well, he’d say, work is – quite simply – the force times the distance in physics, and the work done against the force is the potential energy (usually denoted by U) of that object. 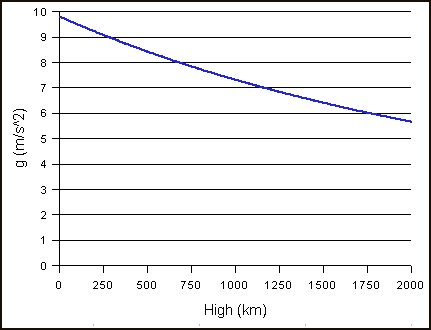 So he would write U = Fh = mgh, with h the height of the object (as measured from the surface of the Earth), and he would draw a nice linear graph like the one below (I set m to 10 kg here, and h ranges from 0 to 100 m). Note that the slope of this line is slightly less than 45 degrees (and also note, of course, that it’s only approximately 45 degrees because of our choice of scale: dU/dh is equal to 98.0665, so if the x and y axes would have the same scale, we’d have a line that’s almost vertical). Such linear graphs are an approximation only. In reality, the gravitational field, and force fields in general, are not uniform and, hence, g is not a constant: the graph below shows how g varies with the height (but the height is expressed in kilometer this time, not in meter). Not only is potential energy usually not a linear function but – equally important – it is usually not a positive real number either. In fact, in physics, U will usually take on a negative value. Why? Because we’re indeed measuring and defining it by the work done against the force. So what’s the more accurate view of things? Well… Let’s start by noting that potential energy is defined in relation to some reference point and, taking a more universal point of view, that reference point will usually be infinity when discussing the gravitational (or electromagnetic) force of attraction. Now, the potential energy of the point(s) at infinity – i.e. the reference point – will, usually, be equated with zero. 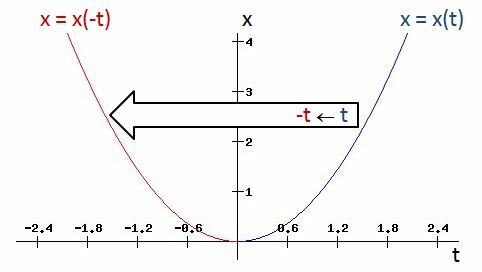 Hence, the potential energy curve will then take the shape of the graph below (y = –1/x), so U will vary from zero (0) to minus infinity (–∞) , as we bring the two masses closer together. You can readily see that the graph below makes sense: its slope is positive and, hence, as such it does capture the same idea as that linear mgh graph above: moving a mass from point 1 to point 2 requires work and, hence, the potential energy at point 2 is higher than at point 1, even if both values U(2) and U(1) are negative numbers, unlike the values of that linear mgh curve. How do you get a curve like that? Well… I should first note another convention which is essential for making the sign come out alright: if the force is gravity, then we should write F = –GmMr/r3. So we have a minus sign here. And please do note the boldface type: F and r are vectors, and vectors have both a direction and magnitude – and so that’s why they are denoted by a bold letter (r), as opposed to the scalar quantities G, m, M or r). Back to the minus sign. Why do we have that here? Well… It has to do with the direction of the force, which, in case of attraction, will be opposite to the so-called radius vector r. Just look at the illustration below, which shows, first, the direction of the force between two opposite electric charges (top) and then (bottom), the force between two masses, let’s say the Earth and the Moon. So it’s a matter of convention really. Now, when we’re talking the electromagnetic force, you know that likes repel and opposites attract, so two charges with the same sign will repel each other, and two charges with opposite sign will attract each other. So F12, i.e. the force on q2 because of the presence of q1, will be equal to F12 = q1q2r/r3. Therefore, no minus sign is needed here because q1 and q2 are opposite and, hence, the sign of this product will be negative. Therefore, we know that the direction of F comes out alright: it’s opposite to the direction of the radius vector r. So the force on a charge q2 which is placed in an electric field produced by a charge q1 is equal to F12 = q1q2r/r3. In short, no minus sign needed here because we already have one. Of course, the original charge q1 will be subject to the very same force and so we should write F21 = –q1q2r/r3. So we’ve got that minus sign again now. In general, however, we’ll write Fij = qiqjr/r3 when dealing with the electromagnetic force, so that’s without a minus sign, because the convention is to draw the radius vector from charge i to charge j and, hence, the radius vector r in the formula F21 would point in the other direction and, hence, the minus sign is not needed. In short, because of the way that the electromagnetic force works, the sign always come out right: there is no need for a minus sign in front. However, for gravity, there are no opposite charges: masses are always alike, and so likes actually attract when we’re talking gravity, and so that’s why we need the minus sign when dealing with the gravitational force: the force between a mass i and another mass j will always be written as Fij = –mimjr/r3, so here we do have to put the minus sign, because the direction of the force needs to be opposite to the direction of the radius vector and so the sign of the ‘charges’ (i.e. the masses in this case), in the case of gravity, does not take care of that. One last remark here may be useful: always watch out to not double-count forces when considering a system with many charges or many masses: both charges (or masses) feel the same force, but with opposite direction. OK. Let’s move on. If you are confused, don’t worry. Just remember that (1) it’s very important to be consistent when drawing that radius vector (it goes from the charge (or mass) causing the force field to the other charge (or mass) that is being brought in), and (2) that the gravitational and electromagnetic forces have a lot in common in terms of ‘geometry’ – notably that inverse proportionality relation with the square of the distance between the two charges or masses – but that we need to put a minus sign when we’re dealing with the gravitational force because, with gravitation, likes do not repel but attract each other, as opposed to electric charges. Now, let’s move on indeed and get back to our discussion of potential energy. Let me copy that potential energy curve again and let’s assume we’re talking electromagnetics here, and that we’re have two opposite charges, so the force is one of attraction. Why the minus sign? Well… As said, we’re not increasing potential energy: we’re decreasing it, from zero to some negative value. If we’d move the charge from point 1 to the reference point (infinity), then we’d be doing work against the force and we’d be increasing potential energy. So then we’d have a positive value. If this is difficult, just think it through for a while and you’ll get there. Why that cosine? Well… To go from one point to another (from point 0 to point 1, for example), we can take any path really. [In fact, it is actually not so obvious that all paths will yield the same value for the potential energy: it is the case for so-called conservative forces only. But so gravity and the electromagnetic force are conservative forces and so, yes, we can take any path and we will find the same value.] Now, if the direction of the force and the direction of the displacement are the same, then that angle θ will be equal to zero and, hence, the dot product is just the product of the magnitudes (cos(0) = 1). However, if the direction of the force and the direction of the displacement are not the same, then it’s only the component of the force in the direction of the displacement that’s doing work, and the magnitude of that component is Fcosθ. So there you are: that explains why we need that cosine function. Does that make sense? Yes. We’re, once again, doing work against the force when moving the charge from point 1 to point 2. So that’s why we have a minus sign in front. As for the signs of q1 and q2, remember these are opposite. As for the value of the (r2 – r1) factor, that’s obviously positive because r2 > r1. 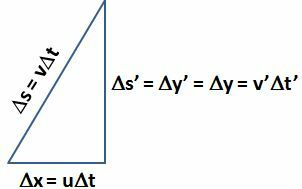 Hence, ΔU = U(1) – U(2) is negative. How do we interpret that? U(2) and U(1) are negative values, the difference between those two values, i.e. U(1) – U(2), is negative as well? 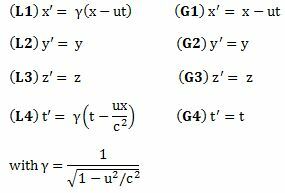 Well… Just remember that ΔU is minus the work done to move the charge from point 1 to point 2. 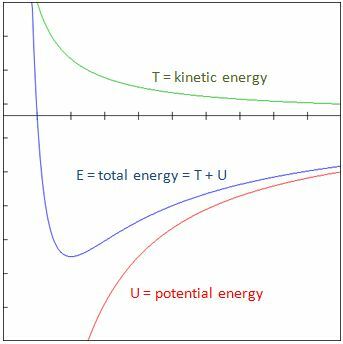 Hence, the change in potential energy (ΔU) is some negative value because the amount of work that needs to be done to move the charge from point 1 to point 2 is decidedly positive. Hence, yes, the charge has a higher energy level (albeit negative – but that’s just because of our convention which equates potential energy at infinity with zero) at point 2 as compared to point 1. What about gravity? Well… That linear graph above is an approximation, we said, and it also takes r = h = 0 as the reference point but it assigns a value of zero for the potential energy there (as opposed to the –∞ value for the electromagnetic force above). So that graph is actually an linearization of a graph resembling the one below: we only start counting when we are on the Earth’s surface, so to say. 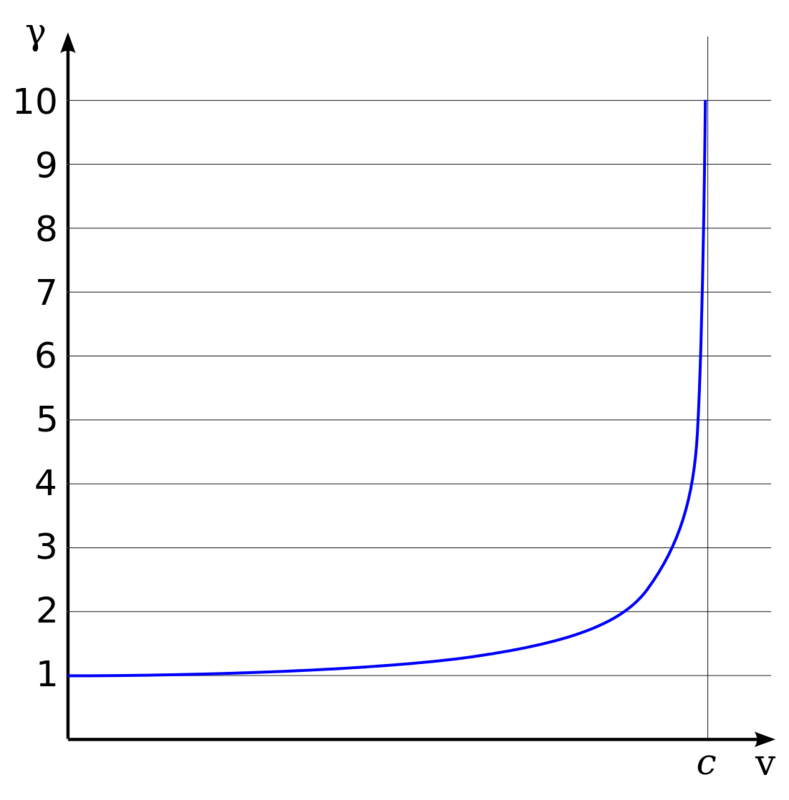 However, in a more advanced physics course, you will probably see the following potential energy function for gravity: U(r) = –GMm/r, and the graph of this function looks exactly the same as that graph we found for the potential energy between two opposite charges: the curve starts at point (0, –∞) and ends at point (∞, 0). OK. Time to move on to another illustration or application: the covalent bond between two hydrogen atoms. 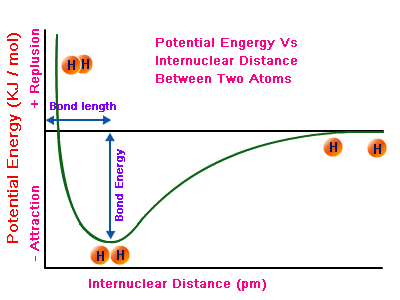 The graph below shows the potential energy as a function of the distance between two hydrogen atoms. Don’t worry about its exact mathematical shape: just try to understand it. Natural hydrogen comes in H2 molecules, so there is a bond between two hydrogen atoms as a result of mutual attraction. The force involved is a chemical bond: the two hydrogen atoms share their so-called valence electron, thereby forming a so-called covalent bond (which is a form of chemical bond indeed, as you should remember from your high-school courses). However, one cannot push two hydrogen atoms too close, because then the positively charged nuclei will start repelling each other, and so that’s what is depicted above: the potential energy goes up very rapidly because the two atoms will repel each other very strongly. The right half of the graph shows how the force of attraction vanishes as the two atoms are separated. After a while, the potential energy does not increase any more and so then the two atoms are free. Again, the reference point does not matter very much: in the graph above, the potential energy is assumed to be zero at infinity (i.e. the ‘free’ state) but we could have chosen another reference point: it would only shift the graph up or down. This brings us to another point: the law of energy conservation. For that, we need to introduce the concept of kinetic energy once again. F = d(mv)/dt (again, all bold letters denote vectors). (2) mv2/2 – GMm/r = constant when the gravitational force is involved (note the minus sign, for the reason mentioned above: when the gravitational force is involved, we need to reverse the sign). 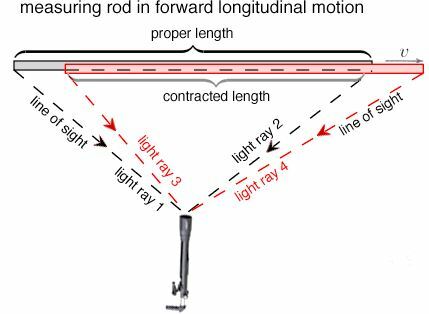 Note: The graph above mentions an ‘ideal’ pendulum because, in reality, there will be an energy loss due to friction and, hence, the pendulum will slowly stop, as shown below. Hence, in reality, energy is conserved, but it leaks out of the system we are observing here: it gets lost as heat, which is another form of kinetic energy actually. A very nice application of the energy concepts introduced above is the so-called Bohr model of a hydrogen atom. Feynman introduces that model as an estimate of the size (or radius) of an atom (see Feynman’s Lectures, Vol. III, p. 2-6). The argument is the following. Now, the electron’s potential energy will be given by that U(r) = q1q2/4πε0r formula above, with q1= e (the charge of the proton) and q2= –e (i.e. the charge of the electron), so we can simplify this to –e2/a. What does this say? It says that the potential energy becomes smaller as a gets smaller (that’s because of the minus sign: when we say ‘smaller’, we actually mean a larger negative value). However, as it gets closer to the nucleus, it kinetic energy increases. In fact, the shape of this function is similar to that graph depicting the potential energy of a covalent bond as a function of the distance, but you should note that the blue graph below is the total energy (so it’s not only potential energy but kinetic energy as well). Note that this calculation depends on the value one uses for e: to be correct, we need to put the 4πε0 factor back in. You also need to ensure you use proper and compatible units for all factors. Just try a couple of times and you should find that 0.528 value. That being said, as we pointed out above, it is all a matter of choosing our reference point: we can add or subtract any constant C to the energy equation: E + C = T + U + C will still be constant and, hence, respect the energy conservation law. But so I’ll conclude here and – of course – check if my kids understand any of this. Oh – yes. I forgot. The title of this post suggests that I would also write something on what is referred to as ‘potential’, and it’s not the same as potential energy. So let me quickly do that. That grad operator is nice: it makes a vector function out of a scalar function. U = –∫F·ds = –q∫E·ds = qΦ with Φ (read: phi) = ∫E·ds = the electrical potential. Unlike the ‘psi’ potential, the ‘phi’ potential is well known to us, if only because it’s expressed in volts. In fact, when we say that a battery or a capacitor is charged to a certain voltage, we actually mean the voltage difference between the parallel plates of which the capacitor or battery consists, so we are actually talking the difference in electrical potential ΔΦ = Φ1 – Φ2., which we also express in volts, just like the electrical potential itself. The model of the atom that is implied in the above derivation is referred to as the so-called Bohr model. It is a rather primitive model (Wikipedia calls it a ‘first-order approximation’) but, despite its limitations, it’s a proper quantum-mechanical view of the hydrogen atom and, hence, Wikipedia notes that “it is still commonly taught to introduce students to quantum mechanics.” Indeed, that’s Feynman also uses it in one of his first Lectures on Quantum Mechanics (Vol. III, Chapter 2), before he moves on to more complex things. Researchers have not been able to find many other traces of non-respect of CP symmetry, except when studying a heavier version of these kaons (the so-called B- and D-mesons) as soon as these could be produced in higher volumes in newer (read: higher-energy) particle colliders (so that’s in the last ten or fifteen years only), but so these B- and D-mesons are even more rare and even less stable. Why? When one reverses all of the charges and other variables (such as parity which – let me remind you – has to do with ‘left-handedness’ and ‘right-handedness’ of particles), then the process should go in the other direction in an exactly symmetric way. Full stop. If not, there’s some kind of ‘leakage’ so to say, and such ‘leakage’ would be ‘kind-of-OK’ when we’d be talking some kind of chemical or biological process, but it’s obviously not ‘kind-of-OK’ when we’re talking one of the fundamental forces. It’s just not ‘logical’. A remark that is much more relevant than the two comments above is that one of the most brilliant physicists of the 20th century, Richard Feynman, seemed to have refused to entertain the idea of CP-symmetry breaking. Indeed, while, in his 1965 Lectures, he devotes quite a bit of attention to Chien-Shiung Wu’s 1956 experiment with decaying cobalt-60 nuclei (i.e. the experiment which first demonstrated parity violation, i.e. the breaking of P-symmetry), he does not mention the 1964 Fitch-Cronin experiment, and all of his writing in these Lectures makes it very clear that he not only strongly believes that the combined CP symmetry holds, but that it’s also the only ‘symmetry’ that matters really, and the only one that Nature truly respects–always. So Feynman was wrong. Of course, these Lectures were published less than a year after the 1964 Fitch-Cronin experiment and, hence, you might think he would have changed his ideas on the possibility of Nature not respecting CP-symmetry–just like Wolfgang Pauli, who could only accept the reality of Nature not respecting reflection symmetry (P-symmetry) after repeated experiments re-confirmed the results of Wu’s original 1956 experiment. But – No! – Feynman’s 1985 book on quantum electrodynamics (QED) –so that’s five years after Fitch and Cronin got a Nobel Prize for their discovery– is equally skeptical on this point: he basically states that the weak force is “not well understood” and that he hopes that “a more beautiful and, hence, more accurate understanding” of things will emerge. OK, you will say, but Feynman passed away shortly after (he died from a rare form of cancer in 1988) and, hence, we should now listen to the current generation of physicists. You’re obviously right, so let’s look around. Hmm… Gerard ‘t Hooft? Yes ! He is 67 now but – despite his age – it is obvious that he surely qualifies as a ‘next-generation’ physicist. He got his Nobel Prize for “elucidating the quantum structure of electroweak interactions” (read: for clarifying how the weak force actually works) and he is also very enthusiastic about all these Grand Unified Theories (most notably string and superstring theory) and so, yes, he should surely know, shouldn’t he? I guess so. However, even ‘t Hooft writes that these experiments with these ‘crazy kaons’ – as he calls them – show ‘violation’ indeed, but that it’s marginal: the very same experiments also show near-symmetry. What’s near-symmetry? Well… Just what the term says: the weak force is almost symmetrical. Hence, CP-symmetry is the norm and CP-asymmetry is only a marginal phenomenon. That being said, it’s there and, hence, it should be explained. How? ‘t Hooft himself writes that one could actually try to interpret the results of the experiment by adding some kind of ‘fifth’ force to our world view – a “super-weak force” as he calls it, which would interfere with the weak force only. What about other explanations? For example, you might be tempted to think these two or three exceptions to a thousand cases respecting the general rule must have something to do with quantum-mechanical uncertainty: when everything is said and done, we’re dealing with probabilities in quantum mechanics, aren’t we? Hence, exceptions do occur and are actually expected to occur. No. Quantum indeterminism is not applicable here. While working with probability amplitudes and probabilities is effectively equivalent to stating some general rules involving some average or mean value and then some standard deviation from that average, we’ve got something else going on here: Fitch and Cronin took a full six months indeed–repeating the experiment over and over and over again–to firmly establish a statistically significant bias away from the theoretical average. Hence, even if the bias is only 0.2% or 0.3%, it is a statistically significant difference between the probability of a process going one way, and the probability of that very same process going the other way. So what? There are so many non-reversible processes and asymmetries in this world: why don’t we just accept this?Well… I’ll just refer to my previous post on this one: we’re talking a fundamental force here – not some chemical reaction – and, hence, if we reverse all of the relevant charges (including things such as left-handed or right-handed spin), the reaction should go the other way, and with exactly the same probability. If it doesn’t, it’s plain weird. Full stop. OK. […] But… Perhaps there is some external phenomenon affecting these likelihoods, like these omnipresent solar neutrinos indeed, which I mentioned in a previous post and which are all left-handed. So perhaps we should allow these to enter the equation as well. […] Well… I already said that would make sense–to some extent at least– because there is some flimsy evidence of solar flares affecting radioactive decay rates (solar flares and neutrino outbursts are closely related, so if solar flares impact radioactive decay, we could or should expect them to meddle with any beta decay process really). That being said, it would not make sense from other, more conventional, points of view: we cannot just ‘add’ neutrinos to the equation because then we’d be in trouble with the conservation laws, first and foremost the energy conservation law! So, even if we would be able to work out some kind of theoretical mechanism involving these left-handed solar neutrinos (which are literally all over the place, bombarding us constantly even if they’re very hard to detect), thus explaining the observed P-asymmetry, we would then have to explain why it violates the energy conservation law! Well… Good luck with that, I’d say! While kaons are short-lived particles because of the presence of the second-generation (and, hence, unstable) s-quark, they are real particles (so they are not some resonance or some so-called virtual particle). Hence, studying their behavior in interactions with any force field (and, most notably, their behavior in regard to the weak force) is extremely relevant, and the observed CP asymmetry–no matter how small–is something which should really grab our attention. The philosophical implications of any form of non-respect of the combined CP symmetry for our common-sense notion of time are truly profound and, therefore, the Fitch-Cronin experiment rightly deserves a lot of accolades. So let’s analyze these ‘philosophical implications’ (which is just a somewhat ‘charged’ term for the linkage between CP- and time-symmetry which I want to discuss here) somewhat more in detail. 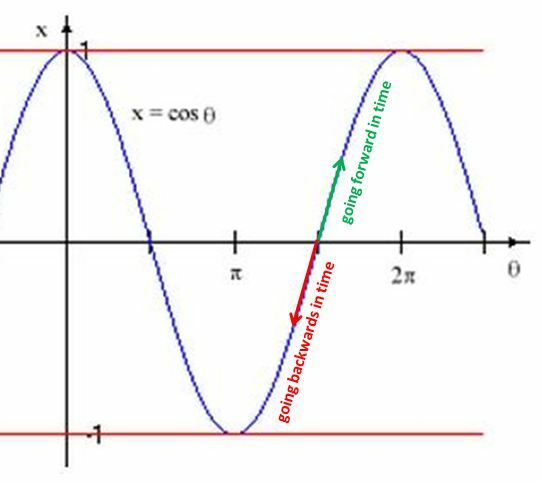 In the previous posts, I said it’s probably useful to distinguish (a) time-reversal as a (loosely defined) philosophical concept from (b) the mathematical definition of time-reversal, which is much more precise and unambiguous. It’s the latter which is generally used in physics, and it amounts to putting a minus sign in front of all time variables in any equation describing some situation, process or system in physics. That’s it really. Nothing more. The point that I wanted to make is that true time reversal – i.e. time-reversal in the ‘philosophical’ or ‘common-sense’ interpretation – also involves a reversal of the forces, and that’s done through reversing all charges causing those forces. I used the example of the movie as a metaphor: most movies, when played backwards, do not make sense, unless we reverse the forces. For example, seeing an object ‘fall back’ to where it was (before it started falling) in a movie playing backwards makes sense only if we would assume that masses repel, instead of attract, each other. Likewise, any static or dynamic electromagnetic phenomena we would see in that backwards playing movie would make sense only if we would assume that the charges of the protons and electrons causing the electromagnetic fields involved would be reversed. How? Well… I don’t know. Just imagine some magic. In such world view–i.e. a world view which connects the arrow of time with real-life forces that cause our world to change– I also looked at the left- and right-handedness of particles as some kind of ‘charge’, because it co-determines how the weak force plays out. 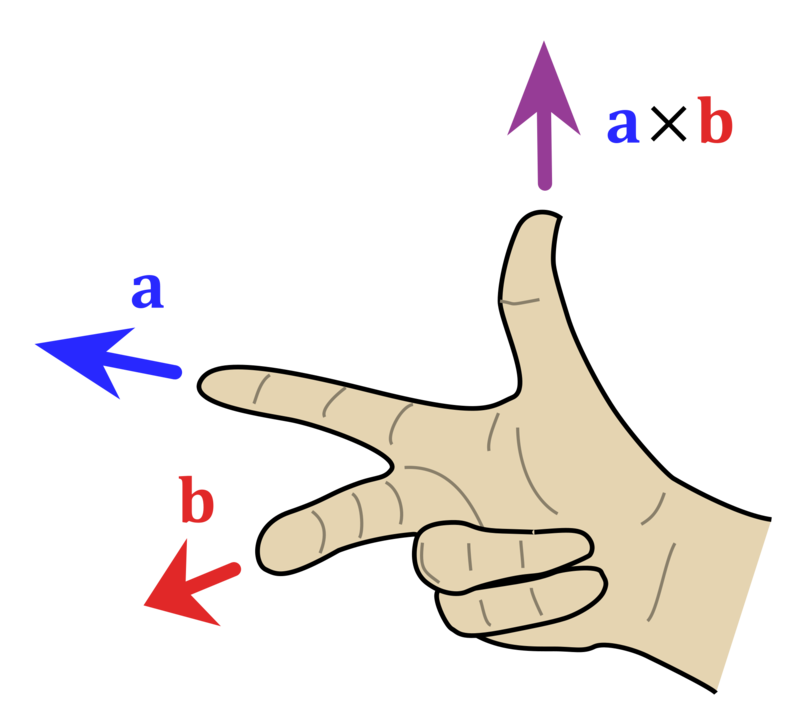 Hence, any phenomenon in the movie having to do with the weak force (such as beta decay) could also be time-reversed by making left-handed particles right-handed, and right-handed particles left-handed. In short, I said that, when it comes to time reversal, only a full CPT-transformation makes sense–from a philosophical point of view that is. Now, reversing left- and right-handedness amounts to a P-transformation (and don’t interrupt me now by asking why physicists use this rather awkward word ‘parity’ for what’s left- and right-handedness really), just like a C-transformation amounts to reversing electric and ‘color’ charges (‘color’ charges are the charges involved in the strong nuclear force). Now, if only a full CPT transformation makes sense, then CP-reversal should also mean T-reversal, and vice versa. Feynman’s story about “the guy in the ‘other’ universe” (see my previous post) was quite instructive in that regard, and so let’s look at the finer points of that story once again. Is ‘another’ world possible at all? Feynman’s assumption was that we’ve made contact (don’t ask how: somehow) with some other intelligent being living in some ‘other’ world somewhere ‘out there’, and that there are no visual or other common references. That’s all rather vague, you’ll say, but just hang in there and try to see where we’re going with this story. Most notably, the other intelligent being – but let’s call ‘it’ a she instead of ‘a guy’ or ‘a Martian’ – cannot see the universe as we see it: we can’t describe, for instance, the Big and Small Dipper and explain to her what ‘left’ and ‘right’ is referring to such constellations, because she’s sealed off somehow from it (so she lives in a totally different corner of the universe really). In contrast, we would be able, most probably, to explain and share the concept of ‘upward’ and ‘downwards’ by assuming that she is also attracted by some center of gravity nearby, just like we are attracted downwards by our Earth. Then, after many more hours and days, weeks, months or even years of tedious ‘discussions’, we would probably be able to describe electric currents and explain electromagnetic phenomena, and then, hopefully, she would find out that the laws in her corner of the universe are exactly the same, and so we could thus explain and share the notion of a ‘positive’ and a ‘negative’ charge, and the notion of a magnetic ‘north’ and ‘south’ pole. Talking about the strong force wouldn’t help either, because it also fully respects charge symmetry. Huh? Yes. Just go through my previous post which – I admit – was probably quite confusing but made the point that a ‘mirror-image’ world would work just as well… except when it comes to the weak force. 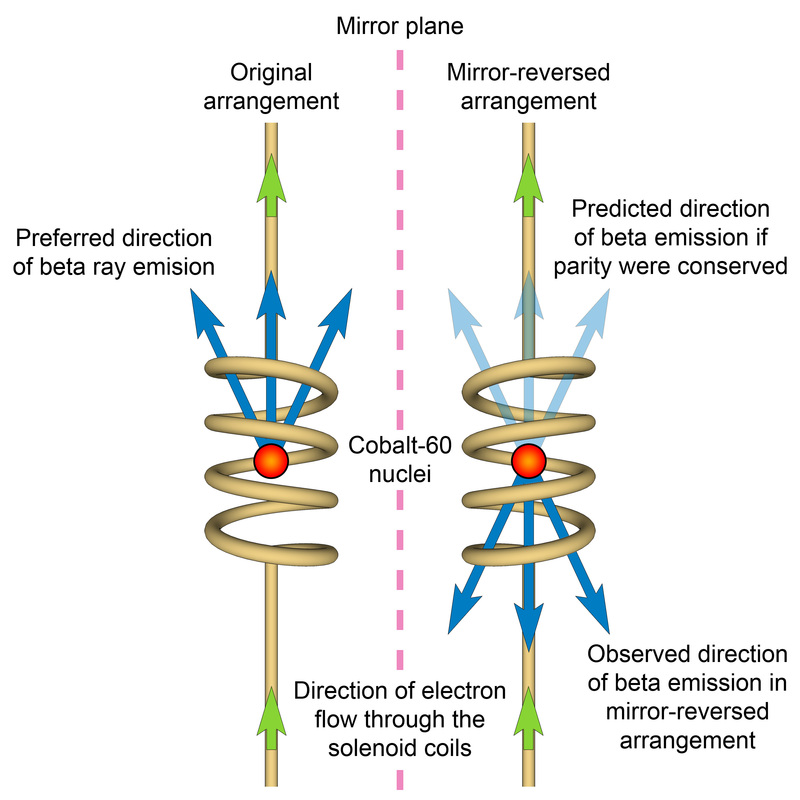 Indeed, atomic decay processes (beta decay) do distinguish between ‘left-handed’ and ‘right-handed’ particles (as measured by their spin) in an absolute sense that is (see the illustration of decaying muons and their mirror-image in the previous post) and, hence, it’s simple: in order to make sure her ‘left’ and her ‘right’ is the same as ours, we should just ask her to perform those beta decay experiments demonstrating that parity (or P-symmetry) is not being conserved and, then, based on our common definition of what’s ‘up’ and ‘down’ (the commonality of these notions being based on the effects of gravity which, we assume, are the same in both worlds), we could agree that ‘right’ is ‘right’ indeed, and that ‘left’ is ‘left’ indeed. Now, you will remember there was one ‘catch’ here: if ever we would want to set up an actual meeting with her (just assume that we’ve finally figured out where she is and so we (or she) are on our way to meet each other), we would have to ask her to respect protocol and put out her right hand to greet us, not her left. The reason is the following: while ‘right-handed’ and ‘left-handed’ matter behave differently when it comes to weak force interactions (read: atomic decay processes)–which is how we can distinguish between ‘left’ and ‘right’ in the first place, in some kind of absolute sense that is–the combined CP symmetry implies that right-handed matter and left-handed anti-matter behave just the same–and, of course, the same goes for ‘left-handed’ matter and ‘right-handed’ anti-matter. Hence, after we would have had a painstakingly long exchange on broken P-symmetry to ensure we are talking about the same thing, we would still not know for sure: she might be living in a world of anti-matter indeed, in which case her ‘right’ would actually be ‘left’ for us, and her ‘left’ would be ‘right’. Indeed, the Fitch-Cronin experiment brings an additional twist to this potentially romantic story between two intelligent beings from two ‘different’ worlds. In fact, the Fitch-Cronin experiment actually rules out this theoretical possibility of mutual destruction and, therefore, the possibility of two ‘different’ worlds. The argument goes straight to the heart of our philosophical discussion on time reversal. Indeed, whatever you may or may not have understood from this and my previous posts on CPT symmetry, the key point is that the combined CPT symmetry cannot be violated. Why? Well… That’s plain logic: the real world does not care about our conventions, so reversing all of our conventions, i.e. describes a world truly going back in time. Now, ‘her’ world is not going back in time. Why? Well… Because we can actually talk to her, it is obvious that her ‘arrow of time’ points in the same direction as ours, so she is not living in a world that is going back in time. Full stop. Therefore, any experiment involving a combined CP asymmetry (i.e. C-P violation) should yield the same results and, hence, she should find the same bias, i.e. a bias going in the very same direction of the equation, i.e. from left to right, or from right to left – whatever (what we label it, depends on our conventions, which we ‘re-set’ as we talked to her, and, hence, which we share, based on the results of all these beta decay experiments we did to ensure we’re really talking about the ‘same’ direction, and not its opposite). Is this confusing? It sure is. But let me rephrase the logic. Perhaps it helps. Combined CPT symmetry implies that if the combined CP-symmetry is broken, then T-symmetry is also broken. Hence, the experimentally established fact of broken CP symmetry (even if it’s only 2 or 3 times per thousand) ensures that the ‘arrow of time’ points in one direction, and in one direction only. To put it simply: we cannot reverse time in a world which does not (fully) respect the principle of CP symmetry. Now, if you and I can exchange meaningful signals (i.e. communicate), then your and my ‘arrow of time’ obviously point in the same direction. To put it simply, we’re actors in the same movie, and whether or not it is being played backwards doesn’t matter anymore: the point is that the two of us share the same arrow of time. In other words, God did not do any combined CPT-transformation trick on your world as compared to mine, and vice versa. Hence, ‘your’ world is ‘my’ world and vice versa. So we live in the same world with the very same symmetries and asymmetries. Now apply this logic to our imaginary new friend (‘she’) and (I hope) you’ll get the point. To make a long story short, and also to conclude our philosophical digressions here on a pleasant (romantic) note: the fact that we would be able to communicate with her, implies that she’d be living in the same world as ours. We know that now, for sure, because of the broken CP symmetry: indeed, if her ‘time arrow’ points in the same direction, then CP symmetry will be broken in just the very same way in ‘her’ world (i.e. the ‘bias’ will have the same direction, in an absolute sense) as it it is broken in ‘our’ world. In short, there are only two possible worlds: (1) this world and (2) one and only one ‘other’ world. This ‘other’ world is our world under a full CPT-transformation: the whole movie played backwards in other words, but with all ‘charges’ affecting forces – in whatever form and shape they come (electric charge, color charge, spin, and what have you) reversed or – using that awful mathematical term – ‘negated’. In case you’d wonder (2): An oscillating-universe theory, or some kind of cyclic thing (so Big Bangs followed by Big Crunches) are not incompatible with my ‘two-possible-worlds’ view of things. However, this ‘oscillations’ would all take place in the same world really, because the arrow of time isn’t being reversed really, as Big Bangs and Big Crunches do not reverse charges and parities–at least not to my knowledge. But, of course, who knows? 1. You may wonder what ‘other’ asymmetries I am hinting at in this post here. It’s quite simple. It’s everything you see around you, including the works of the increasing entropy law. However, if I would have to choose one asymmetry in this world (the real world), as an example of a very striking and/or meaningful asymmetry, it’s the the preponderance of matter over anti-matter, including the preponderance of (left-handed) neutrinos over (right-handed) antineutrinos. Indeed, I can’t shake off that feeling that neutrino physics is going to spring some surprises in the coming decades. We know that T-symmetry has not been broken: ‘her’ arrow of time points in the same direction. Therefore, the combined CP-symmetry of ‘her’ world is broken in the same way as in our world. If the combined CP-symmetry in ‘her’ world is broken in the same way as in ‘our’ world, the individual C and P symmetries have to be broken in the very same way. In other words, it’s the same world indeed. Not some anti-matter world. 3. What about the increasing entropy law in this story? What happens to it if we reverse time, charge and parity? Well… Nothing. It will remain valid, as always. So that’s why an actual movie being played backwards with charges and parities reversed will still not make any sense to us: things that are broken don’t repair themselves and, hence, at the system level, there’s another type of irreducible ‘arrow of time’ it seems. But you’ll have to admit that the character of that entropy ‘law’ is very different from these ‘fundamental’ force laws. And then just think about it, isn’t it extremely improbable how we human beings have evolved in this universe? And how we are seemingly capable to understand ourselves and this universe? We don’t violate the entropy law obviously (on the contrary: we’re obviously messing up our planet), but I feel we do negate it in a way that escapes the kind of logical thinking that underpins the story I wrote above. But such remarks have nothing to do with math or physics and, hence, I will refrain from them. In my previous posts, I introduced the concept of time symmetry, and parity and charge symmetry as well. However, let’s try to explore T-symmetry first. It’s not an easy concept – contrary to what one might think at first. The first phenomenon – cars racing backwards – is unlikely to happen in real life but quite possible, and some crazies actually do organize such races. The last example – objects defying gravity – is plain impossible because of Newton’s universal law of gravitation. The other examples – the old becoming young (and the dead coming back to life), and glass shards coming back together into one piece – are also plain impossible because of some other ‘law’: the law of ever increasing entropy. However, there’s a distinct difference between the two ‘laws’ (gravity versus increasing entropy). As one entry on Physics Stack Exchange notes, the entropy law – better known as the second law of thermodynamics – “only describes what is most likely to happen in macroscopic systems, rather than what has to happen”, but then the author immediately qualifies this apparent lack of determinism, and rightly so: “It is true that a system may spontaneously decrease its entropy over some time period, with a small but non-zero probability. However, the probability of this happening over and over again tends to zero over long times, so is completely impossible in the limit of very long times.” Hence, while one will find some people wondering whether this entropy law is a ‘real law’ of Nature – in the sense that they would question that it’s always true no matter what – there is actually no room for such doubts. That being said, the character of the entropy law and the universal law of gravitation is obviously somewhat different – because they describe different realities: the entropy law is a law at the level of a system (a room full of air, for example), while the law of gravitation describes one of the four fundamental forces. I will now be a bit more formal. What’s time symmetry in physics? The Wikipedia definition is the following: “T-symmetry is the theoretical symmetry (invariance) of physical laws under a time reversal (T) transformation.” Huh? A ‘time reversal transformation’ amounts to inserting –t (minus t) instead of t in all of our equations describing trajectories or physical laws. Such transformation is illustrated below. 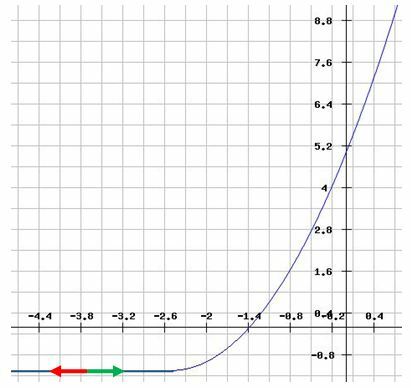 The blue curve might represent a car or a rocket accelerating (in this particular example, we have a constant acceleration a = 2). 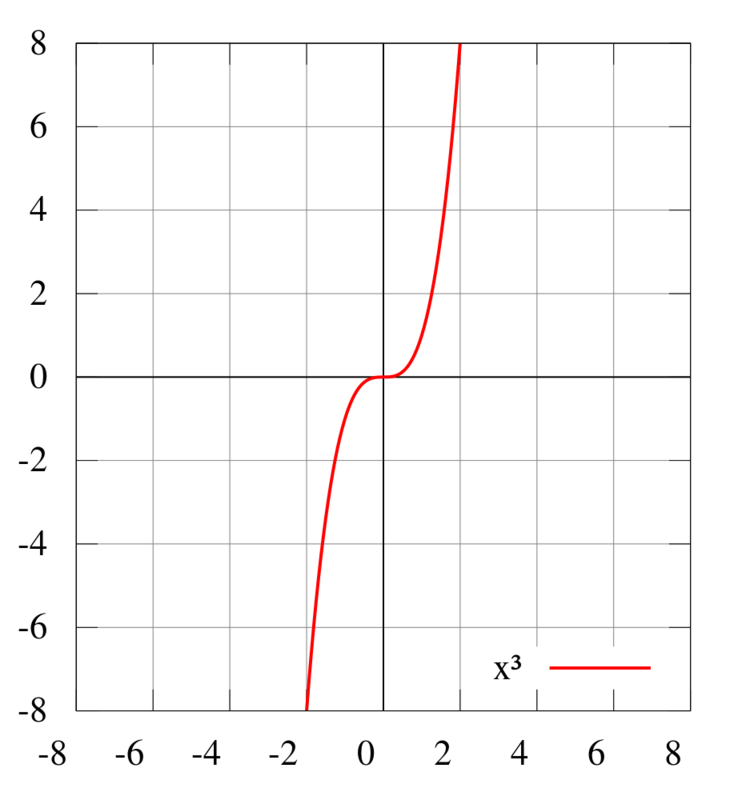 The vertical axis measures the displacement (x) as a function of time (t). , and the red curve is its T-transformation. The two curves are each other’s mirror image, with the vertical axis (i.e. the axis measuring the displacement x) as the mirror axis. Note that velocity (and mass) determines (linear and angular) momentum and, hence, a T-transformation will also negate p and l, i.e. the linear and angular momentum of a particle. Such variables – i.e. variables that are negated by the T-transformation – are referred to as odd variables, as opposed to even variables, which are not impacted by the T-transformation: the position of the particle or object (x) is an example of an even variable, and the force acting on a particle (F) is not being negated either: it just remains what it is, i.e. an external force acting on some mass or some charge. The acceleration itself is another ‘even’ variable. This all makes sense: why would the force or acceleration change? When we put a minus sign in front of the time variable, we are basically just changing the direction of an axis measuring an independent variable. In a way, the only thing that we are doing is introducing some non-standard way of measuring time, isn’t it? Instead of counting from 0 to T, we count from 0 to minus T.
Well… No. In this post, I want to discuss actual time reversal. Can we go back in time? Can we put a genie back into a bottle? Can we reverse all processes in Nature and, if not, why not? Time reversal and time symmetry are two different things: doing a T-transformation is a mathematical operation; trying to reverse time is something real. Let’s take an example from kinematics to illustrate the matter. Kinematics can be summed up in one equation, best known as Newton’s Second Law: F = ma = m(dv/dt) = d(mv)/dt. In words: the time-rate-of-change of a quantity called momentum (mv) is proportional to the force on an object. In other words: the acceleration (a) of an object is proportional to the force (F), and the factor of proportionality is the mass of the object (m). Hence, the mass of an object is nothing but a measure of its inertia. Newton’s First Law is the principle of inertia: if there’s no (other) force acting on an object, it will just continue doing what it does–i.e. nothing or, else, move in some straight line according to the direction of its momentum (i.e. the product of its mass and its velocity)–or further engage with the force it was already engaged with. Newton’s Second Law is the law of kinematics. In kinematics, we analyze the motion of an object without caring about the origin of the force causing the motion. So we just describe how some force impacts the motion of the object on which it is acting without asking any questions about the force itself. We’ve written this law above: F = ma. Finally, Newton’s Third Law is the law of gravitation, which describes the origin, the nature and the strength of the gravitational force. That’s part of dynamics, i.e. the study of the forces themselves – as opposed to kinematics, which only looks at the motion caused by those forces. Of course, when we – i.e. you and me right here and right now – are talking time reversal, we obviously do it from some kind of vantage point. That vantage point will usually be the “now” (and quite often also the “here”), and so let’s use that as our reference frame indeed and we will refer to it as the zero time point: t = 0. So it’s not the origin of time: it’s just ‘now’–the start of our analysis. Now, the idea of going back in time also implies the idea of looking forward – and vice versa. Let’s first do what we’re used to do and so that’s to look forward. At some point in the future, let’s call it t = T, the velocity of our object will be equal to v(T) = v(0) + aT. Why the v(0)? Well… We defined the zero time point (t = 0) in a totally random way and, hence, our object is unlikely to stop for that. On the contrary: it is likely to already have some velocity and so that’s why we’re adding this v(0) here. As for the space coordinate, our object may also not be at the exact same spot as we are (we don’t want to be to close to a departing rocket I would assume), so we can also not assume that x(0) = 0 and so we will also incorporate that term somehow. It’s not essential to the analysis though. So that ‘makes sense’. However, I am not talking mathematical consistency when I am asking if it still ‘makes sense’. Let us interpret all of this by looking at what’s happening with the velocity. At t = 0, the velocity of the object is v(0), but T seconds ago, i.e. at point t = -T, the velocity of the object was v(-T) = v(0) – aT. 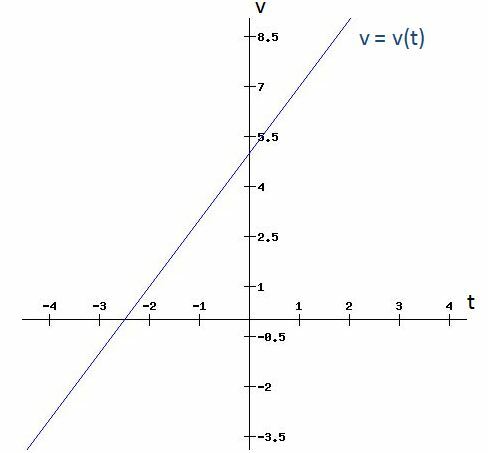 This velocity is less than v(0) and, depending on the value of -T, it might actually be negative. Hence, when we’re looking back in time, we see the object decelerating (and we should immediately add that the deceleration is – just like the acceleration – a constant). In fact, it’s the very same constant a which determines when the velocity becomes zero and then, when going even further back in time, when it becomes negative. Huh? Negative velocity? Here’s the difference with the movie: in that movie that we are playing backwards, our car, our rocket, or the glass falling from a table or a pedestal would come to rest at some point back in time. We can calculate that point from our velocity equation v(t) = v(0) + at. In the example below, our object started accelerating 2.5 seconds ago, at point t = –2.5. But, unlike what we would see happening in our backwards-playing movie, we see that object not only stopping but also reversing its direction, to go in the same direction as we saw it going when we’re watching the movie before we hit the ‘Play Backwards’ button. So, yes, the velocity of our object changes sign as it starts following the trajectory on the left side of the graph. What’s going on here? Well… Rest assured: it’s actually quite simple: because the car or that rocket in our movie are real-life objects which were actually at rest before t = –2.5, the left side of the graph above is – quite simply – not relevant: it’s just a mathematical thing. So it does not depict the real-life trajectory of an accelerating car or rocket. The real-life trajectory of that car or rocket is depicted below. So we also have a ‘left side’ here: a horizontal line representing no movement at all. Our movie may or may not have included this status quo. If it did, you should note that we would not be able to distinguish whether or not it would be playing forward or backwards. In fact, we wouldn’t be able to tell whether the movie was playing at all: we might just as well have hit the ‘pause’ button and stare at a frozen screenshot. Does that make sense? Yes. There are no forces acting on this object here and, hence, there is no arrow of time. The numerical example above is confusing because our mind is not only thinking about the trajectory as such but also about the force causing the particle—or the car or the rocket in the example above—to move in this or that direction. When it’s a rocket, we know it ignited its boosters 2.5 seconds ago (because that’s what we saw – in reality or in a movie of the event) and, hence, seeing that same rocket move backwards – both in time as well as in space – while its boosters operate at full thrust does not make sense to us. Likewise, an obstacle escaping gravity with no other forces acting on it does not make sense either. That being said, reversing the trajectory and, hence, actually reversing the effects of time, should not be a problem—from a purely theoretical point at least: we should just apply twice the force produced by the boosters to give that rocket the same acceleration in the reverse direction. That would obviously means we would force it to crash back into the Earth. Because that would be rather complicated (we’d need twice as many boosters but mounted in the opposite direction), and because it would also be somewhat evil from a moral point of view, let us consider some less destructive examples. In the case of the electrostatic force (remember that likes repel and opposites attract), the magnitude of E is equal to E = qc/4πε0r2. In this equation, ε0 is the electric constant, which we’ve encountered before, and r is the distance between the charge q and the charge qc causing the field). 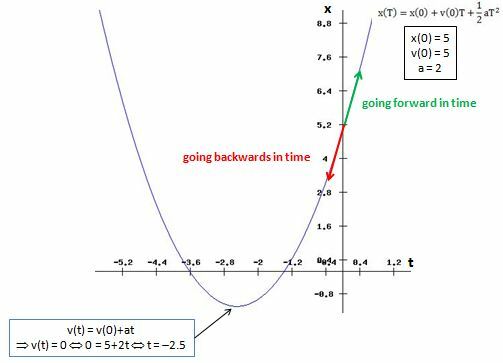 So now we’ve explained the dynamics behind that x(t) = x(0) + v(0)·t + (a/2)·t2 curve above, and it’s these dynamics that explain why looking back in time does not make sense—not in a mathematical way but in philosophical way. Indeed, it’s the nature of the force that gives time (or the direction of motion, which is the very same ‘arrow of time’) one–and only one–logical direction. OK… But so what is time reversibility then – or time symmetry as it’s referred to? Let me defer an answer to this question by first introducing another topic. I already introduced the concept of even and odd variables above. It’s obviously linked to some symmetry/asymmetry. The x(t) curve above is symmetric. It is obvious that, if we would change our coordinate system to let x(0) equal x(0) = 0, and also choose the origin of time such that v(0) = 0, then we’d have a nice symmetry with respect to the vertical axis. The graph of the quadratic function below illustrates such symmetry. 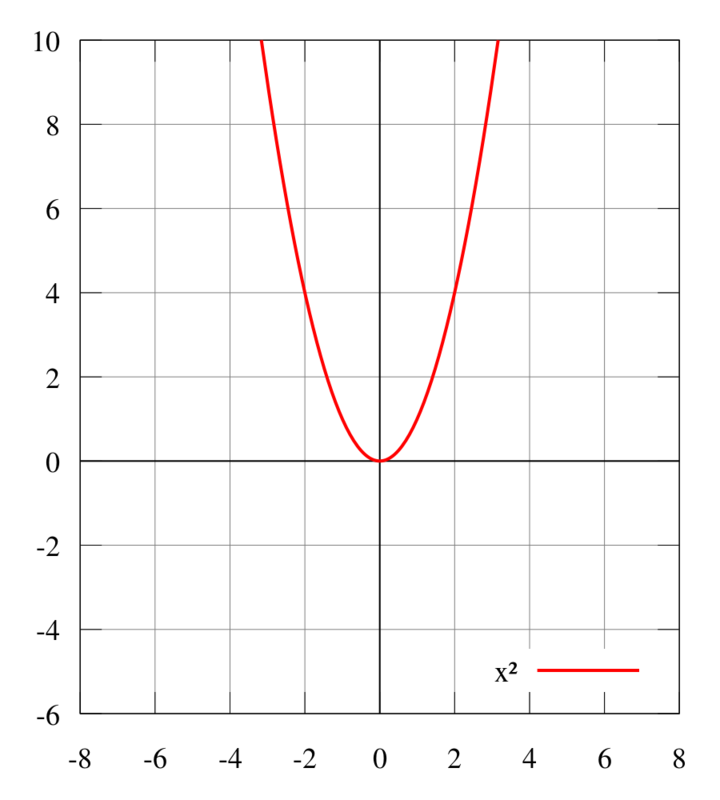 Functions with a graph such as the one above are called even functions. A (real-valued) function f(t) of a (real) variable t is defined as even if, for all t and –t in the domain of f, we find that f(t) = f(–t). We also have odd functions, such as the one depicted below. An odd function is a function for which f(-t) = –f(t). 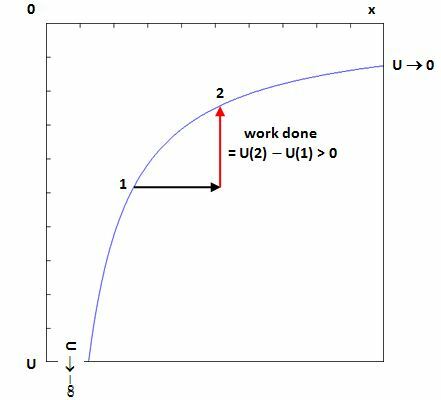 The function below gives the velocity as a function of time, and it’s clear that this would be an odd function if we would choose the zero time point such that v(0) = 0. In that case, we’d have a line through the origin and the graph would show an odd function. So that’s why we refer to v as an odd variable under time reversal. A very particular and very interesting example of an even function is the cosine function – as illustrated below. Now, we said that the left side of the graph of the trajectory of our car or our rocket (i.e. the side with a negative slope and, hence, negative velocity) did not make much sense, because – as we play our movie backwards – it would depict a car or a rocket accelerating in the absence of a force. 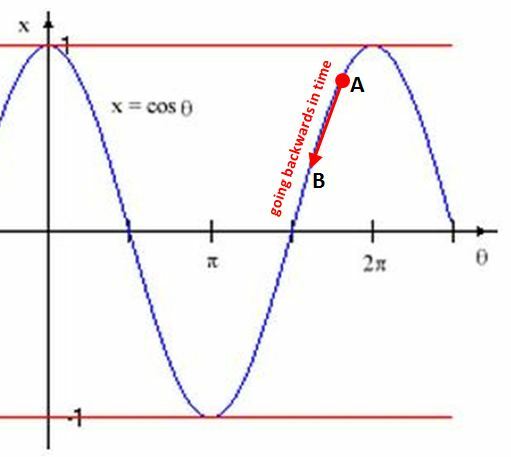 But let’s look at another situation here: a cosine function like the one above could actually represent the trajectory of a mass oscillating on a spring, as illustrated below. What’s important is that, in this case, the ‘arrow of time’ could point either way, and both make sense. In other words, when we would make a movie of this oscillating movement, we could play it backwards and it would still make sense. Huh? Yes. Just in case you would wonder whether this conclusion depends on our starting point, it doesn’t. Just look at the illustration below, in which I assume we are starting to watch that movie (which is being played backwards without us knowing it is being played backwards) of the oscillating spring when the mass is not in the equilibrium position. It makes perfect sense: the spring is stretched, and we see the mass accelerating to the equilibrium position, as it should. At point A, the spring is still being stretched further, in reality that is, and so the mass is moving away from the equilibrium position. Hence, in reality, it will not move to point B but further away from the equilibrium position. However, we could imagine it moving from point A to B if we would reverse the direction of the force. Indeed, the force is equal to –kx and reversing its direction is equivalent to flipping our graph around the horizontal axis (i.e. the time axis), or to shifting the time axis left or right with an amount equal to π (note that the ‘time’ axis is actually represented by the phase, but that’s a minor technical detail and it does not change the analysis: we just measure time in radians here instead of seconds). It’s a visual trick. There is no ‘real’ symmetry. The flipped graph corresponds to another situation (i.e. some other spring that started oscillating a bit earlier or later than ours here). Hence, our conclusion that it is the force that gives time direction, still holds. Hmm… Let’s think about this. What makes our ‘trick’ work is that the force is allowed to change direction. Well… If we go back to our previous example of an object falling towards the center of some gravitational field, or a charge being attracted by some other (opposite) charge, then you’ll note that we can make sense of the ‘left side’ of the graph if we would change the sign of the force. Huh? Yes, I know. This is getting complicated. But think about it. 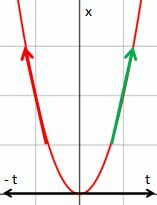 The graph below might represent a charged particle being repelled by another (stationary) particle: that’s the green arrow. We can then go back in time (i.e. we reverse the green arrow) if we reverse the direction of the force from repulsion to attraction. Now, that would usually lead to a dramatic event—the end of the story to be precise. Indeed, once the two particles get together, they’re glued together and so we’d have to draw another horizontal line going in the minus t direction (i.e. to the left side of our time axis) representing the status quo. Indeed, if the two particles sit right on top of each other, or if they would literally fuse or annihilate each other (like a particle and an anti-particle), then there’s no force or anything left at all… except if… we would alter the direction of the force once again, in which case the two particles would fly apart again (OK. OK. You’re right in noting that’s not true in the annihilation case – but that’s a minor detail). Is this story getting too complicated? It shouldn’t. The point to note is that reversibility – i.e. time reversal in the philosophical meaning of the word (not that mathematical business of inserting negative variables instead of positive ones) – is all about changing the direction of the force: going back in time implies that we reverse the effects of time, and reversing the effects of time, requires forces acting in the opposite direction. Now, when it’s only kinetic energy that is involved, then it should be easy but when charges are involved, which is the case for all fundamental forces, then it’s not so easy. That’s when charge (C) and parity (P) symmetry come into the picture. Hooke’s ‘Law’ – i.e. the law describing the force on a mass on a stretched or compressed spring – is not a fundamental law: eventually the spring will stop. Yes. It will stop even if when it’s in a horizontal position and with the mass moving on a frictionless surface, as assumed above: the forces between the atoms and/or molecules in the spring give the spring the elasticity which causes the mass to oscillate around some equilibrium position, but some of the energy of that continuous movement gets lost in heat energy (yes, an oscillating spring does actually get warmer!) and, hence, eventually the movement will peter out and stop. Nevertheless, the lesson we learned above is a valuable one: when it comes to the fundamental forces, we can reverse the arrow of time and still make sense of it all if we also reverse the ‘charges’. The term ‘charges’ encompasses anything measuring a propensity to interact through one of the four fundamental forces here. That’s where CPT symmetry comes in: if we reverse time, we should also reverse the charges. But how can we change the ‘sign’ of mass: mass is always positive, isn’t it? And what about the P-symmetry – this thing about left-handed and right-handed neutrinos? As for now, I can only note that the particles in an ‘anti-world’ would have the same mass. In that sense, anti-matter is not ‘anti’-matter: it just carries opposite electromagnetic, strong and weak charges. Hence, our C-world (so the world we get when applying a charge transformation) would have all ‘charges’ reversed, but mass would still be mass. 2. As for parity symmetry (i.e. left- and right-handedness, aka as mirror symmetry), I note that it’s raised primarily in relation to the so-called weak force and, hence, it’s also a ‘charge’ of sorts—in my primitive view of the world at least. The illustration below shows what P symmetry is all about really and may or may not help you to appreciate the point. OK. What is this? Let’s just go step by step here. The ‘cylinder’ (both in (a), the upper part of the illustration, and in (b), the lower part) represents a muon—or a bunch of muons actually. A muon is an unstable particle in the lepton family. Think of it as a very heavy electron for all practical purposes: it’s about 200 times the mass of an electron indeed. Its lifetime is fairly short from our (human) point of view–only 2.2 microseconds on average–but that’s actually an eternity when compared to other unstable particles. In any case, the point to note is that it usually decays into (i) two neutrinos (one muon-neutrino and one electron-antineutrino to be precise) and – importantly – (ii) one electron, so electric charge is preserved (indeed, neutrinos got the name they have because they carry no electric charge). 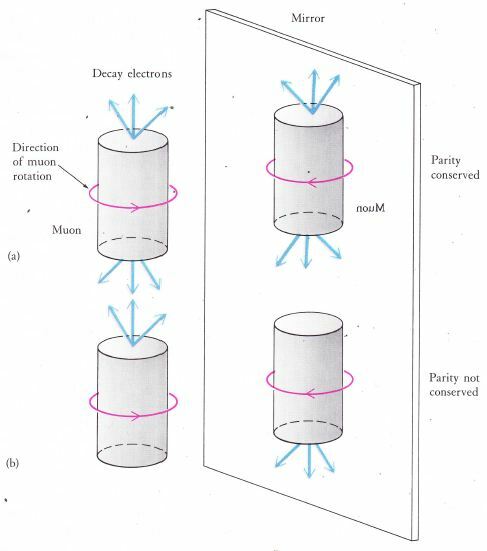 Now, we have left- and right-handed muons, and we can actually line them up in one of these two directions. I would need to check how that’s done, but muons do have a magnetic moment (just like electrons) and so I must assume it’s done in the same way as in Wu’s cobalt-60 experiment: through a uniform magnetic field. In other words, we know their spin directions in an experiment like this. Now, if the weak force would respect mirror symmetry (but we already know it doesn’t), we would not be able to distinguish (i) the muon decay process in the ‘mirror world’ (i.e. the reflection of what’s going on in the (imaginary) mirror in the illustration above) from (ii) the decay process in ‘our’ (real) world. So that would be situation (a): the number of decay electrons being emitted in an upward direction would be the same (more or less) as the amount of decay electrons being emitted in a downward direction. However, the actual laboratory experiments show that situation (b) is actually the case: most of the electrons are being emitted in only one direction (i.e. the upward direction in the illustration above) and, hence, the weak force does not respect mirror symmetry. So what? Is that a problem? I should also note that Wolfgang Pauli, one of the pioneers of quantum mechanics, said that it was “total nonsense” when he was informed about Wu’s experimental results, and that repeated experiments were needed to actually convince him that we cannot just create a mirror world out of ours. For me, it is not a problem.I like to think of left- and right-handedness as some charge itself, and of the combined CPT symmetry as the only symmetry that matters really. That should be evident from my rather intuitive introduction on time symmetry above. Consider it and decide for yourself how logical or illogical it is. We could define what Feynman refers to as an axial vector: watching that muon ‘from below’, we see that its spin is clockwise, and let’s use that fact to define an axial vector pointing in the same direction as the thick black arrow (it’s the so-called ‘right-hand screw rule’ really), as shown below. Now, let’s suppose that mirror world actually exists, in some corner in the universe, and that a guy living in that ‘mirror world’ would use that very same ‘right-hand-screw rule’: his axial vector when doing this experiment would point in the opposite direction (see the thick black arrow in the mirror, which points in the opposite direction indeed). So what’s wrong with that? Nothing – in my modest view at least. Left- and right-handedness can just be looked at as any other ‘charge’ – I think – and, hence, if we would be able to communicate with that guy in the ‘mirror world’, the two experiments would come out the same. So the other guy would also notice that the weak force does not respect mirror symmetry but so there’s nothing wrong with that: he and I should just get over it and continue to do business as usual, wouldn’t you agree? After all, there could be a zillion reasons for the experiment giving the results it does: perhaps the ‘right-handed’ spin of the muon is sort of transferred to the electron as the muon decays, thereby giving it the same type of magnetic moment as the one that made the muon line up in the first place. Or – in a much wilder hypothesis which no serious physicist would accept – perhaps we actually do not yet understand everything of the weak decay process: perhaps we’ve got all these solar neutrinos (which all share the same spin direction) interfering in the process. Whatever it is: Nature knows the difference between left and right, and I think there’s nothing wrong with that. Full stop. But then what is ‘left’ and ‘right’ really? As the experiment pointed out, we can actually distinguish between the two in some kind of absolute sense. It’s not just a convention. As Feynman notes, we could decide to label ‘right’ as ‘left’, and ‘left’ as ‘right’ right here and right now – and impose the new convention everywhere – but then these physics experiments will always yield the same physical results, regardless of our conventions. So, while we’d put different stickers on the results, the laws of physics would continue to distinguish between left and right in the same absolute sense as Wu’s cobalt-60 decay experiment did back in 1956. The really interesting thing in this rather lengthy discussion–in my humble opinion at least–is that imaginary ‘guy in the mirror world’. Could such mirror world exist? Why not? Let’s suppose it does really exist and that we can establish some conversation with that guy (or whatever other intelligent life form inhabiting that world). We could then use these beta decay processes to make sure his ‘left’ and ‘right’ definitions are equal to our ‘left’ and ‘right’ definitions. Indeed, we would tell him that the muons can be left- or right-handed, and we would ask him to check his definition of ‘right-handed’ by asking him to repeat Wu’s experiment. And, then, when finally inviting him over and preparing to physically meet with him, we should tell him he should use his “right” hand to greet us. Yes. We should really do that. A final remark should be made on the relation between all those symmetries and conservation laws. When everything is said and done, all that we’ve got is some nice graphs and then some axis or plane of symmetry (in two and three dimensions respectively). Is there anything more to it? There is. When describing a particle traveling through an electrostatic or gravitation field, we basically just made the case that potential energy is converted into kinetic energy, or vice versa. When describing an oscillating mass on a spring, we basically looked at the spring as a reservoir of energy – releasing and absorbing kinetic energy as the mass oscillates around its zero energy point – but, once again, all we described was a system in which the total amount of energy – kinetic and elastic – remained the same. Energy is being conserved. Therefore, if you want to reverse time, you’ll need to reverse the forces as well. And reversing the forces implies a change of sign of the charges causing those forces. In short, one should not be fascinated by T-symmetry alone. Combined CPT symmetry is much more intuitive as a concept and, hence, much more interesting. So, what’s left? What does it mean in quantum mechanics? How does the Uncertainty Principle come into play? What about the other ‘conservation laws’ (such as the conservation of linear or angular momentum, for example)? How are they related to these ‘symmetries’. Well… That’s complicated business it seems, and even Feynman doesn’t explore these topics in the above-mentioned final Lecture on (classical) mechanics. In any case, this post has become much too long already so I’ll just say goodbye for the moment. I promise I’ll get back to you on all of this. If you have read my previous post (The Weird Force), you’ll wonder why – in the example of how a mirror world would relate to ours – I assume that the combined CP symmetry holds. Indeed, when discussing the ‘weird force’ (i.e. the weak force), I mentioned that it does not respect any of the symmetries, except for the combined CPT symmetry. So it does not respect (i) C symmetry, (ii) P symmetry and – importantly – it also does not respect the combined CP symmetry. This is a deep philosophical point which I’ll talk about in my next post. However, I needed this post as an ‘introduction’ to the next one.